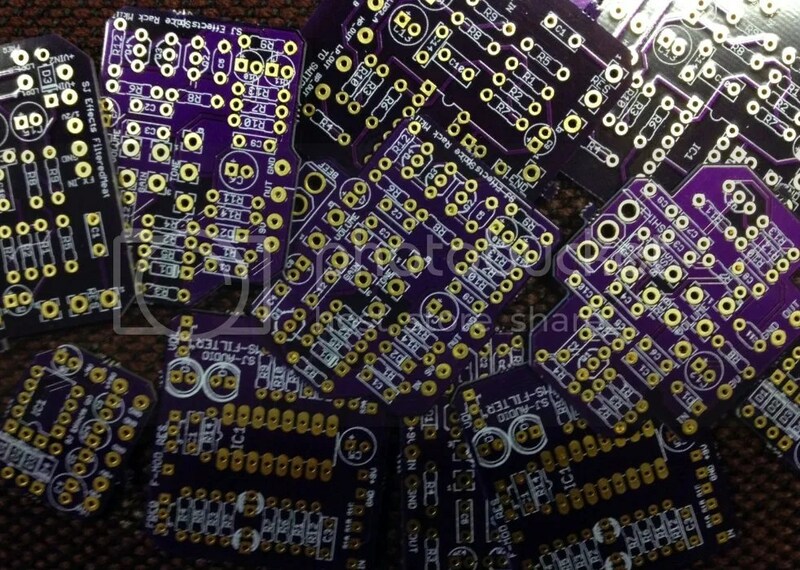 I got a load of prototype PCB’s back the other day. I’m gonna be a busy boy building these up. A discrete Baxandall EQ/preamp. For use with amps that have no tone controls). An Overdrive of my own design. Its using a Mosfet slamming a JFet Mu-Amp gain stage. A Voltage Doubler/Inverter. This is for bumping up +9V supply to +18V (handy for JFet dirt boxes), or inverting a +9V supply to -9V. Tim Escobedo’s 9V MS-20 filter (see schematic here). I want to build this to run loops etc. from my DAW through. State Variable Filter. Has BP, LP and HP outputs. We’ll see how this one pans out, it may need some tweaking. I’m looking forward to building these up and checking them out. The EQ and Overdrive are my original designs so I’m pretty excited!